Depending on the source of these four little words, you can either take them as encouragement, or wash them down with a big ol’ grain of salt. The auto manufacturer advertising its new, fuel-efficient hybrid, for example? Sure, you can probably believe it. Your special lady friend after a particularly disappointing coital effort, though? And as disc golf has trended toward critical mass, it seems everything that accompanies it – Bigger distance! Bigger courses! Bigger coverage! – has become amplified. And disc golf bags are the main offenders. Toting your plastic – a duty that was once relegated to a plastic grocery bag, old backpack, or – gasp! – one’s hand – has now become all about size. 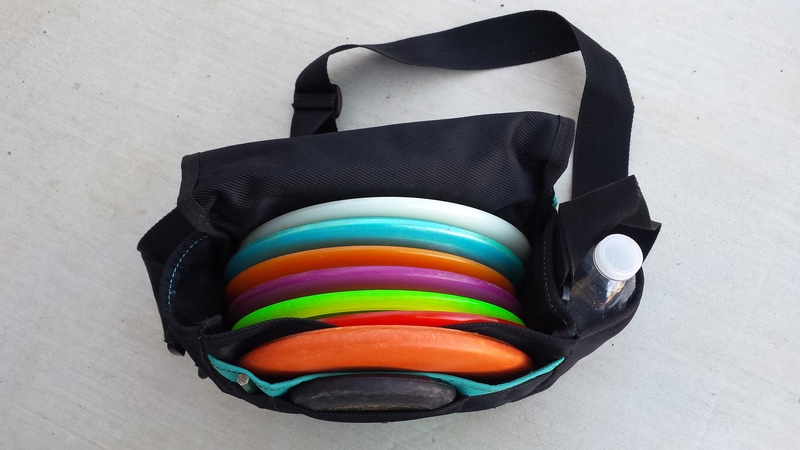 If you aren’t carrying 20-plus discs in a sport-specific over-the-shoulder holder, you’re doing it wrong, right? Wrong. And the Reptilian Disc Golf Gecko Bag is exhibit A in the case against bigger being better. The Reptilian Disc Golf Gecko packs a mini pocket and pencil holder (top) onto the front, while employing a rear driver sleeve (bottom) to make use of normally-wasted space. A collaboration with No Excuses Disc Golf, the Gecko is Reptilian’s first foray into the bag market: A “heavy duty casual bag” for players who want to keep it simple. But just because it is simple doesn’t mean it skimps on quality. Constructed with 1000D Cordura – the same bulletproof material used on high end hiking packs and other disc golf carrying devices – and a neoprene drink pocket, the Gecko is a one-strap bag that holds anywhere from four to eight discs and a 24 oz. bottle of your favorite beverage. Even with these high-end materials, the bag still retails for a mere $35. 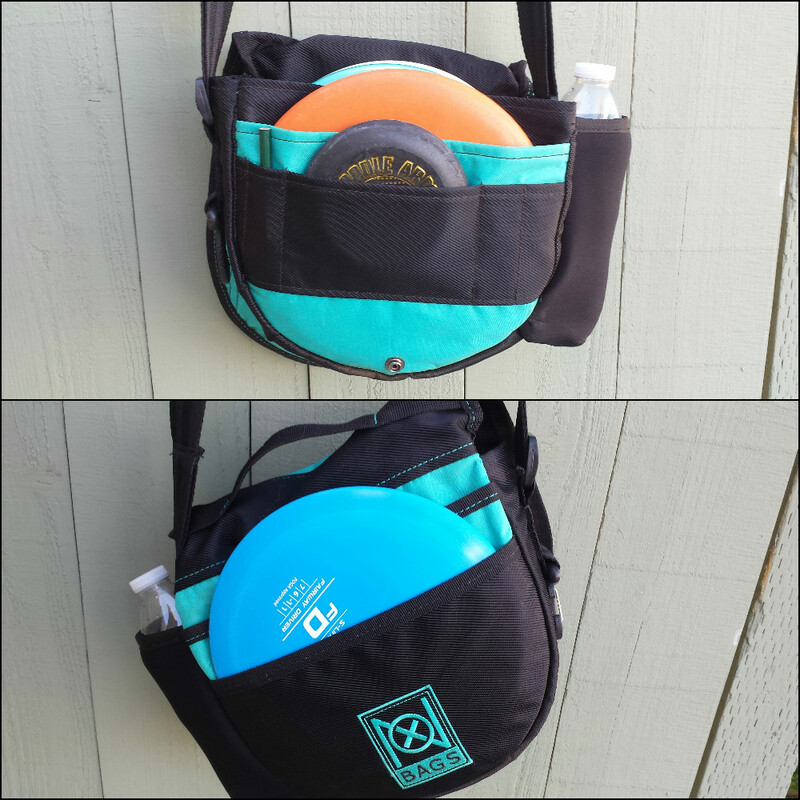 And while a smaller footprint might mean fewer discs, the Gecko still packs the usual amenities disc golfers need for a successful round: A mini pocket, pencil holders, and a towel clip are all standard, while a generously-sized zipper pocket stores your valuables in the front flap. Top it off with a magnetic clasp to help keep the main pocket closed, as well as a sleeve on the back that is crafted to hold your go-to driver, and the Gecko packs big-bag quality into a compact package. For such a small bag, though, the Gecko is surprisingly versatile. Want to go with a simple four-disc set-up and challenge yourself? It will have room to spare with only a driver, midrange, putter, and utility mold. Or, feel free to max it out by storing a putter in the front sleeve, driver on the back, and a complement of six other discs in the main pocket. The Gecko can be maxed out with one putter up front, six discs in the main compartment, and an extra driver (not shown) on the back. Personally, I’ve found the sweet spot with the Gecko to be six discs: three drivers, one midrange, and two putters. For most of my local courses, this rig leaves me with everything I need to not only test my game, but to also still feel competitive. In fact, in all of the rounds I played with the Gecko in a six disc arrangement, I can’t recall ever thinking that I was missing something from my normal bag. Sure, I didn’t leave myself any latitude to lose a disc, but I also saved some wear and tear on my body by carrying something much lighter than a backpack full of Frisbees. The feature that I really feel brings the Gecko this extreme level of versatility in such a limited space is the aforementioned rear driver sleeve. By taking this unused space – normally the back of the bag will sit against your side and you don’t think about it much, right? – and augmenting it for extra storage, it shows that the minds at Reptilian and No Excuses have put some next-level thought into their design. Plus, it takes the convenience factor that is normally only reserved for a putter and extends it to your go-to driver. It’s really a plus-plus feature. Reptilian’s commitment to listening to customers and improving the bag is also impressive. From the beginning, the company has taken feedback to heart and implemented changes to make the Gecko more user-friendly, including expanding the water bottle pocket from its original 12 oz.-only size and sewing up the internal pocket so valuables stopped sliding into a deep cavern in the doldrums of the bag. The magnetic clasp to keep the front flap closed is also a response to prior defects with a snap closure. The end result? Not only are you getting a quality product, but you can rest easy knowing Reptilian is always open to constructive criticism. Far and away, the main draw of the Gecko is its portability. Sporting a max-capacity footprint of 12″ x 10″ x 4″, it is easily packed into a carry-on suitcase for hitting the course on a business trip or stashed underneath the front seat of your car for a quick round on the way home from work. Plus, being able to cinch it up and sling it over your shoulder means it can pretty much go anywhere. This summer, on a trip to the Colorado River, I found a convenient little nine hole course a short jaunt from where we were parked for the day. I packed the Gecko with four discs, a bottle of water, and a floppy hat, then hopped on a jet ski and rode across the river to the course. The bag was plenty light and didn’t get in my way while riding, and the neoprene water bottle holder kept things relatively cool in the scorching 111 degree temps. Could I do this with a backpack bag? Probably. But when it’s that hot, the extra weight and a back covered in sweat are less than desirable. Plus, a small bag took up little space in a car already packed with a cooler and a family’s worth of snacks and bags. For this trip, and for so many others, the Gecko just made sense. And really, that’s what I want out of a bag, no matter the size: something that makes sense. With smart design elements and durable materials, the Gecko does just that. In this case, bigger isn’t better. When I realized Noodle Arm Disc Golf was closing in on 2,000 likes on Facebook, I knew I wanted to give away more than just a disc to commemorate the occasion. So let’s make it one of these high quality Gecko bags instead! As soon as the page hits 2,000, I’ll choose a winner who commented on this review post to receive a brand new Gecko bag. This is the updated, expanded water capacity version, not the previous iteration I reviewed. Boom! 2) LIKE Reptilian Disc Golf. 3) LIKE and COMMENT on the pinned post for this review at the Noodle Arm Disc Golf page. For your comment, TAG A FRIEND and get them to LIKE the page! Plus, if they like the page and comment, too, they are also entered. This is the fastest way to get to 2,000 likes and release the Gecko to the wild. 4) As always, SHARE the review for a bonus entry. The contest will run until the Facebook page hits the magic number, so it’s up to the readers how long that takes. Good luck, and thanks for the support!